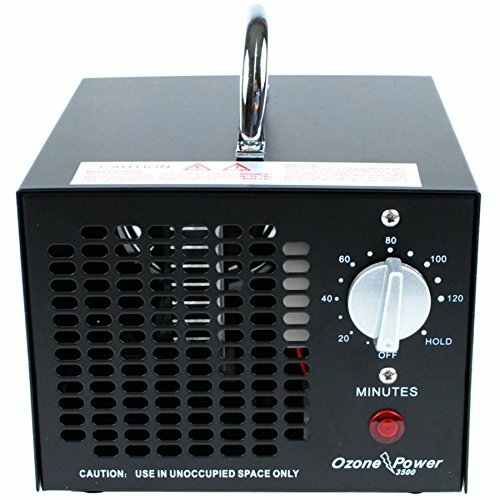 The Ozone Power OP3500 Commercial Air purifier is simple to use and offers professional strength purification to those looking to control and eliminate odors from mold and mildew, smoke, and more in spaces up to 4,000 square feet. It produces O3 (Ozone) which is a naturally occurring substance and very effective at breaking down odor causing pollutants. Ozone is that clean, fresh smell in the air after a thunderstorm. While ozone is very powerful, it has a very short life-cycle. When contaminants such as odors, bacteria or viruses make contact with ozone, they are destroyed completely by oxidation. In so doing, that extra atom of oxygen is consumed and there is nothing left...no odor...no bacteria...no extra atom, only oxygen. Ozone reverts back to oxygen after it is used. Plug the unit in to any 110v outlet and using the built-in timer, turn the unit on for the desired treatment time (cars 30-40 min, medium-large rooms 40-60 minutes, basements 60-120 minutes, entire houses 120 minutes). While the space is being treated it needs to be unoccupied as the concentration of Ozone will make the air irritating to breath during treatment. After the treatment time is over, wait 45 min for the Ozone inside to dissipate and revert to Oxygen. The number of treatment cycles a space requires depends on the severity of the odor, however it is more effective to run the unit in bursts/cycles than non-stop for extended periods of time (more than 4 hours at a time). This unit does have an exclusive 'always-on' hold feature which allows it to run for more than 2 hours at a time, or to be paired with a wall outlet timer for automated use. COMMERCIAL GRADE: True 4000 mg/hr Ozone output delivers unmatched odor destroying results. NATURAL ODOR REMOVER: Ozone is nature's secret weapon for fighting odors and purifying air. WORKS ON ALL ODORS: Smoke, paint, pet, musty basements... you name it. They are no match for Ozone. BEST WARRANTY: Our 5 year warranty is standard with each unit, making it a great investment. If you have any questions about this product by Ozone Power, contact us by completing and submitting the form below. If you are looking for a specif part number, please include it with your message.